[Elk out front of Comfort Inn in Eagle.] 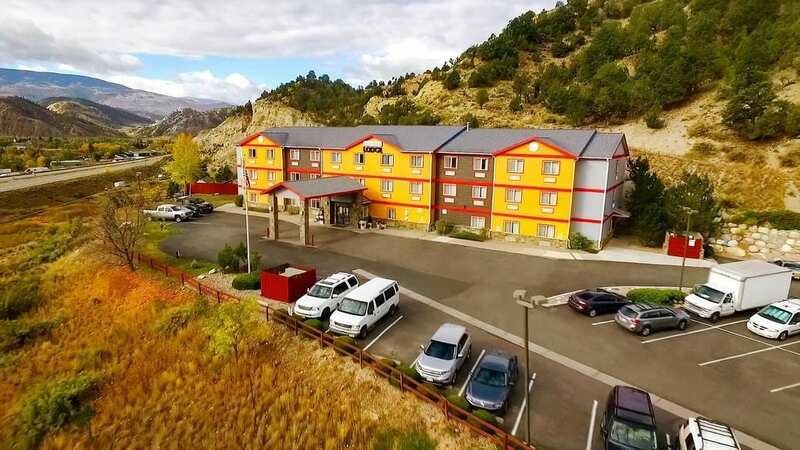 Eagle is one of the most accessible places to stay on I-70, providing a lovely home in Eagle County and wicked easy day trips between Summit and Garfield County. Its range of affordable hotel accommodations will please most guests, along with its western charm. If you’re looking to save money on lodging and still play at the Vail Valley resorts, Eagle can be a refreshing take on your Colorado trip. 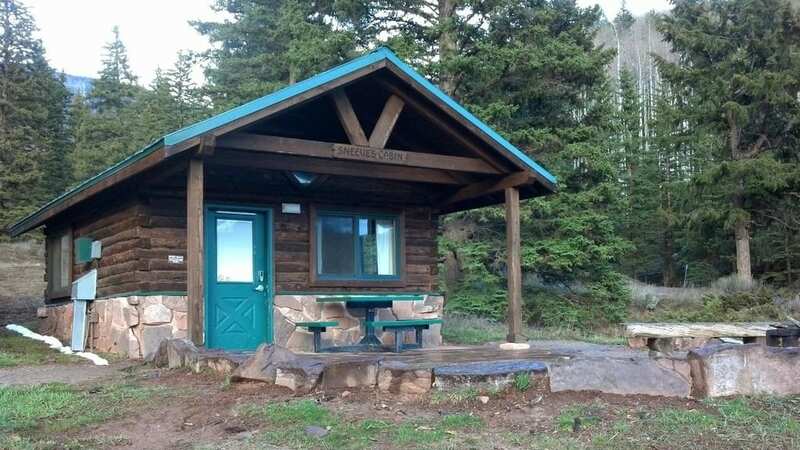 It’s surrounded by mountain ranges and marvelous hiking trails, located an hour east of Vail on the highway. It’s a marvelous town in its own right, with a lot of top attractions. Whether it’s camping, fishing, kayaking, or mountain exploration, Eagle’s the classic weekend getaway, tucked wonderfully in-between Vail and Glenwood Springs. Hotel room at the Best Western Plus. You can explore Eagle’s hidden state park where you can do activities from boating and biking, to staying overnight in a yurt. Sylvan Lake State Park also has a popular geocaching treasure hunting game that uses GPS devices. Discover the different “treasure boxes” spread all over the park! Check out geocaching.com to get your coordinates. For a more carefree activity, you can visit the family-friendly Yeoman Discover Trail or take a trip to Eagle’s very own microbreweries. Its fun downtown section has several historic blocks of shops and restaurants. Most hotels and vacation rentals put you in the heart of town. This section contains referral links. If you click through and take action, we may receive a commission, at no additional cost to you. Rates listed below are subject to change. Comfort Inn Vail Valley, Eagle, CO. 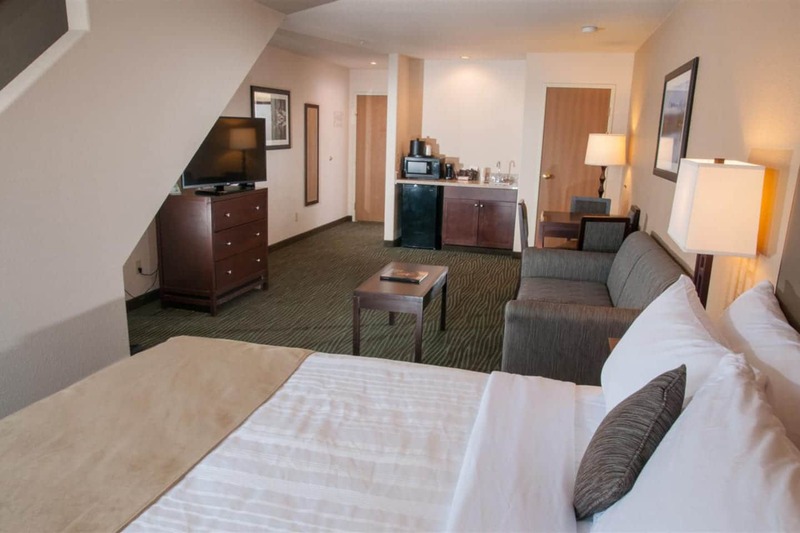 Comfort Inn Vail Valley is one of the top-rated hotels in town and there’s a reason they have become a fan favorite. From the moment you park your car, you know that you’re in a special place. The hotel entrance makes you feel like you’re entering a museum. The high ceiling and the warm lobby are so pleasing, you’ll feel so at home in the town. There are no grandiose chandeliers, in-your-face-bold art in the walls, nor glass designs that can make you feel stuffy when you walk in. The furniture and interior designs are quite down-to-earth and the main feature is the sunlight. The rooms are flexible so whether you’re traveling solo or in a large group, you can choose different accommodations. They have a breakfast area, business rooms, and indoor swimming pool. The comfort theme follows through every corner of the hotel. What also makes the stay special, aside from the top hotel service, is the fact that Comfort Inn Vail Valley backs up into White River National Forest. With 60 air-conditioned rooms (some are pet-friendly), every guest has astonishing landscape views. 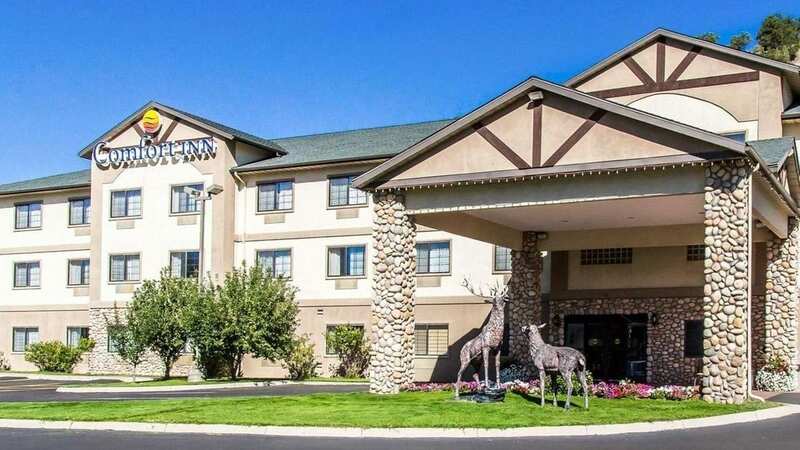 Though close to nature, Quality Inn is also near the shopping and dining in town. Most of the top restaurants in Eagle are just walking distance from the hotel. This hotel maintains a quiet, secluded ambiance, but still allows you to have access to important spots in town. When it comes to location, views, value, and service, Comfort Inn Vail Valley is a reliable choice. 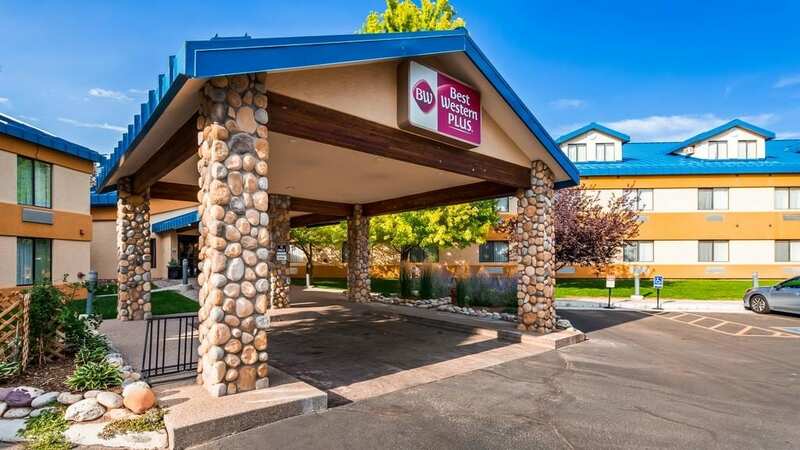 Best Western Plus Eagle Lodge & Suites, Eagle, CO.
For those who’ve had longer stays in town, they found that Eagle has its own charm. One of the hotel highlights is Best Western Plus. It’s a popular hotel in Colorado because they make up for the overly saturated accommodations in Vail or Beaver during high seasons. Since the location is under an hour away from Vail, visitors get the best of both Vail and Eagle while staying at Best Western. The hotel has modern amenities mixed with traditional interiors that reflect the adventurous lifestyle at Eagle. Their spacious pet-friendly rooms vary from the standard king bedrooms to the more upscaled 3-bedroom penthouse, which can accommodate up to 12 persons. Each room will have high-speed WiFi, coffeemaker, ironing board, microwave, mini refrigerator, plush bedding, adjoining rooms (upon request), 39-inch flat-screen TV, work station, and daily maid service. The other highlights at Best Western Plus are the swimming pool, sauna, and the fitness center. For business travelers who love to work out and relax, these amenities make their stay much more fulfilling. If you’re looking for a fully-equipped hotel accommodation, Best Western is an excellent choice. It may be a little farther to the dining and shopping locations in town, but it’s still close to the main attractions of Eagle County. Eagle River Lodge, Eagle, CO.
Eagle River Lodge is more popular for shorter-term stays or backpackers. It’s relatively cheaper than the alternatives in Vail or Breckenridge. 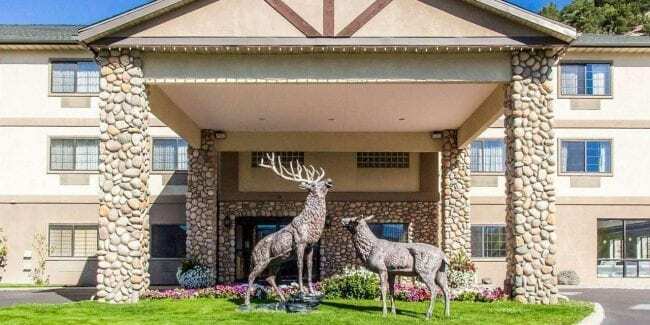 Offering the same amenities and service as those in nearby locations, Eagle River Lodge is a good, budget-friendly compromise. The hotel itself is traditional and straight-forward. They have this Old West ambiance and each room has cool landscape views. After an exhausting trip, you can sit back and relax in their pool, hot tub, or stay in your suites. Past visitors have noted of the delightful breakfast at the hotel. Enjoy their scrambled eggs, bacon, biscuits and gravy or buttered toast. For those who are looking for lighter alternatives, they also have fruit, sweet rolls, and cereals. Hot coffee is available all day long. Sylvan Lake State Park Campground, Eagle, CO. The last, but not the least, is the famous Sylvan Lake State Park. Though Eagle’s neighbor towns are more popular to tourists, visiting this gem is one of the top highlights of the town. It’s the perfect location for those who enjoy the outdoors. As mentioned, Sylvan has a lot of different activities you can enjoy. If you plan to explore the entire park, it’s better to book a unique accommodation here instead of going back and forth to a different hotel. Whether it’s a one night or a whole week, staying within the state park will always be filled with adventure. Aside from just appreciating the lake up close, you can go fishing, paddle boarding and kayaking. There are also short hiking trails that are good for afternoon or morning walks. 12 camper cabins and yurts are available. As for accommodation, there are 46 primitive campsites in total, open year round. If camping, you’ll share a camper services building with flush toilets and coin showers during summer. Year round drinking water and vault toilets remain open. There are also 9 lakeside cabins that can be rented out all year, with 1 of them being a large one great for big groups. 3 yurts can be rented our from mid May to mid November. Each of the sites is evenly distributed across the park so you can still have amazing views. When staying at Sylvan Lake, it’s all about that priceless, memorable views. Whether you’re tucked in for the night at a higher mountain yurt or cabin with views of the lake, the park reflects the true epitome of Eagle’s outdoors charm. That’s our roundup of the coolest places to stay in Eagle, Colorado! Marie is a passionate journalist for nearly 10 years. Book junkie, coffee lover, and a hands-on mom of one. Join her in exploring the wonders of Colorado!